Friends, I’ve got to admit that this whole Thanksgiving is next week thing has caught me off guard. I wish I could say I have my Thanksgiving table designed, my menu set or even my house remotely ready for the impending onslaught of guests. I’m a blogger, I’m supposed to have it all together. Instead, I’m crossing fingers my dining chairs show up in time, I’m frantically pinning center piece ideas and trying to figure out what to cook to satisfy a wide range of dietary restrictions. 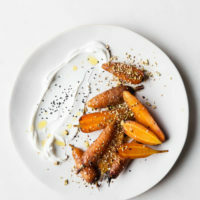 Specifically, I’ll be hosting a vegetarian this year and rather than make them simply survive on side dishes, I want to serve a stunning veggie main event. I’ve started banking ideas but would love your advice. You don’t typically think of cheese at Thanksgiving, but if you’re skipping the meat, it seems it would be nice to have something with some heft – like burrata! 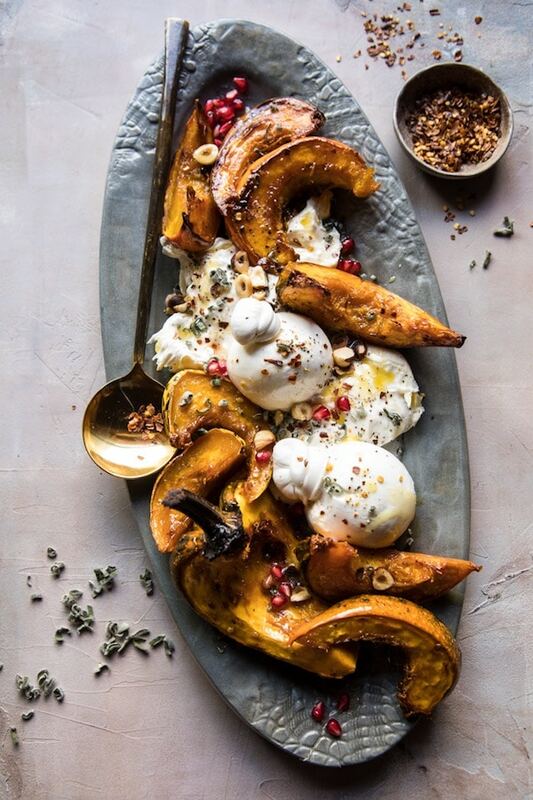 This Honey Butter Roast Acorn Squash with Burrata & Pomegranate definitely has a lot going on, but I think it all sounds pretty delicious. I’m a huge sucker for celery root. It has a wonderful hearty flavor and is wonderfully filling. Combined with bright, acidic balsamic roasted beets and a punch of pearl onion, this celery root puree could definitely hold up on its own. Sweet potatoes are certainly a Thanksgiving staple, but I think this roasted sweet potato dish would stand out when spiced up with maple and harissa. It’s rare to have something with a little heat on the Thanksgiving table. Risotto is one of my all time favorite things. I certainly think it makes a delicious main dish. While time consuming to prepare, making a nice risotto would certainly offer a nice opportunity to sip some wine and do some stirring. This dish combines so many of my favorite ingredients – kombucha squash, sautéed collard greens, quinoa. I’ve never tried a black radish, but I certainly love the look. This recipe just might have to be on my holiday table, regardless of who it is for. Gnocchi is a classic on any Italian table. Mushrooms, arugula and a walnut pesto makes this version particularly flavorful, rich and hearty. I wouldn’t miss turkey if I had this recipe in front of me. So, I’d love your help. If you are or know a vegetarian, what would you enjoy for Thanksgiving? Do you have any go-to recipes in your back pocket? I would love to find the perfect dish! For more Thanksgiving inspiration, CLICK HERE. Out lives spear in a similar trajectory; impending guests, checking off lists, vegetarians for Christmas (thanks giving in your case). I’ll be ahead of the game with all your advice. Cheers! I have been following your Pinterest account for years, but have just visited your blog for the first time and I am in love. I’m particularly thrilled to have found these imaginative recipes you’ve posted for a vegan Thanksgiving. Although, I am not a vegan, I love vegetable dishes and will be making every one of these. Thank you!